The FARC-EP and the Colombian government closed the 37th cycle of peace talks with the decision to establish a Commission for Clarification of Truth, Coexistence and Non-Repetition. 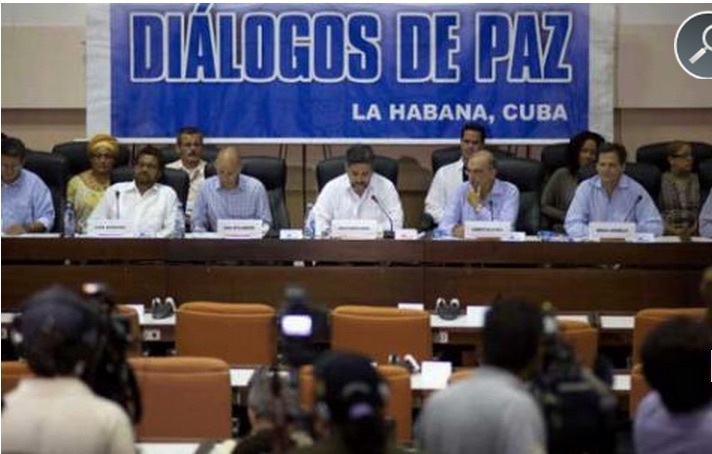 Such a Commission will be set up after the Final Peace Agreement, and will have three main objectives, Rodolfo Benitez, Cuba guarantor at the negotiation table established in this capital since 2012, said yesterday in a news conference. Representatives of the Revolutionary Armed Forces of Colombia-People’s Army (FARC-EP) and the government of President Juan Manuel Santos are attending this roundtable discussion. The first of those objectives is to contribute to the clarification of what happened (…) and provide a full explanation of the complexity of the conflict, said Benitez, accompanied by the government and insurgent peace delegations. The Commission should contribute to the recognition of the victims as citizens who saw their rights violated and the voluntary recognition of individual and collective responsibilities. It should also promote coexistence in the territories, by means of an atmosphere of dialogue and the creation of spaces in which the victims are dignified, he said. According to Benitez, the Commission will be an independent, impartial and extrajudicial mechanism, a part of the comprehensive system of truth, justice, reparation and non-repetition that has to agree to satisfy the rights of victims, end the conflict, and achieve peace. On the other hand, Ivan Marquez, head of the guerrilla delegation, praised the establishment of the truth Commission as a mechanism of justice and reparation, and requested the opening of the State’s files on the conflict for the clarification of what happened regarding this long confrontation.